The 2012 session of the General Assembly was a budget session and the Legislature passed House Bill 265, the two-year budget bill. This bill represents an $18.5 billion spending plan for state government over the next two years. In the House, we started out with goals of protecting basic education funding and health and human services spending, and we were largely able to achieve those goals, while reducing our debt in order to improve our fiscal condition in the eyes of rating agencies. The budget reduces public debt to a level not seen in years. We reduced authorized indebtedness by $577.5 million below what the Governor proposed in his budget recommendation. Our debt ratio, outstanding debt compared to state revenues, will stand at 6.58%, a factor observed closely by bond-rating agencies that grade each state’s finances. This is down from the Governor’s recommendation of 7.1%. We also reduced our “structural imbalance” – that is, our reliance on one-time funds to pay current expenses – from $480 million under the current budget to $215 million by the end of fiscal year 2014. That is a reduction of more than 50% and, once achieved, it will also improve our fiscal condition in the eyes of the rating agencies. In the area of health and human services we were able to protect basic Medicaid spending, allowing the Governor to continue his new program of service delivery through a managed care model. Importantly, we also directed $20.5 million over the two fiscal years to hiring an additional 300 front-line social workers to improve case management, plus $33.4 million over the biennium to phase in an additional 600 Supports for Community Living Slots. This avoids placing these individuals in institutions at much greater cost. Keeping them in their homes and communities also preserves families, which in turn promotes a better quality of life for them. We also appropriated additional funds of $5 million to the Department of Aging to primarily support the Meals on Wheels program. 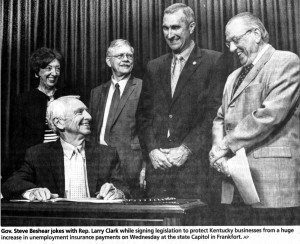 We preserved state funding of $41 million over the biennium for the Quality and Charity Care Trust Agreement, which provides medical care for the working poor throughout Louisville and across Kentucky and southern Indiana. The General Assembly passed a separate budget bill to fund the operations of the court of justice. In the Judicial Branch budget, House Bill 269, we required the Court to maintain days and hours of operation for suburban night courts, including the Outer Loop location, as a convenience to our citizens. For those who have children in Catholic Parish schools, the transportation budget includes an increase over last year’s budget from $2.88 million in fiscal year 2012 to $2.95 million in fiscal years 2013/2014 for non-public pupil transportation. This represents a percentage increase of about 1.4% from the last budget. These funds help ensure the safe transportation of these children to and from school. In the transportation budget, we provided $50 million in each fiscal year of the biennium to support the Louisville and Southern Indiana Ohio River Bridges Project. With the recent approval of the bridges financing plan by the Kentucky Public Transportation Infrastructure Authority, we are steps closer to actually beginning construction on this project sometime in 2012. A recent economic impact study projects that the $2.6 billion bridges project will generate an average of 18,000 jobs over the next thirty (30) years, $27.3 billion in additional personal income and $78 billion in additional economic output over the same period. This impact, along with more efficient cross-river transportation and improved roadway safety substantiates the public investment both Kentucky and Indiana are making to see this project through to completion. Click here for more information about road projects for the 46th District. House Bill 495: This legislation provides a mechanism for the state to repay interest owed on loans from the federal government to pay unemployment insurance benefits. Failure to repay this interest would have resulted in a $600 million federal tax increase on our employers at a time when our economic recovery is just now gaining steam. HB 495 sets up a mechanism to repay the interest owed and avoid the tax increase without any decrease in benefits. House Bill 246: This session I sponsored legislation, House Bill 405, to extend an income tax credit that UPS receives for paying tuition and other education expenses for the part-time college students it hires. That tax credit was set to expire – to “sunset” – in 2013. UPS has over 2000 students employed and enrolled in its Metropolitan College program with the University of Louisville and Jefferson Community and Technical College. House Bill 405 increased the number of students for which UPS could claim a credit from 2800 to 4200 and removed the “sunset” provision. Late in the session, the Senate passed a bill to extend the sunset provision to 2017, and the House concurred in that bill, House Bill 246. Extending the credit allows UPS, its employees/students, and the postsecondary institutions to better plan for the future. House Bill 400: House Bill 400 broadens the provisions of a jobs bill that passed the legislature in 2007 so that Toyota, General Motors and several automotive parts suppliers can take advantage of tax incentives like those that Ford Motor Company utilized when it expanded the Louisville Assembly Plant a couple of years ago. These companies must have a minimum of 1000 employees and plan to invest at least $100 million in their production facilities in order to qualify for incentives. Toyota is eligible right now, and it is hoped that GM would consider expansion at its Bowling Green Corvette plant. This legislation will provide additional support for Kentucky’s auto and parts manufacturing sector, which is extremely important to our economic success. It remains an honor and a privilege to represent you, the citizens of the 46th Legislative District, in the House of Representatives, where I continue to maintain a 100% voting record, working every day on the issues important to you. Please feel free to contact me about these subjects at your convenience. Thanks very much for your time and attention. 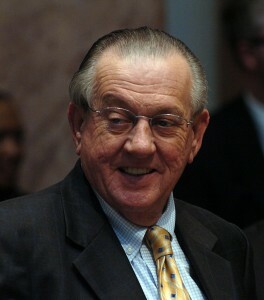 To read more about legislation enacted by The General Assembly during this session or any other, feel free to access the Legislative Research Commission Website at www.lrc.ky.gov.